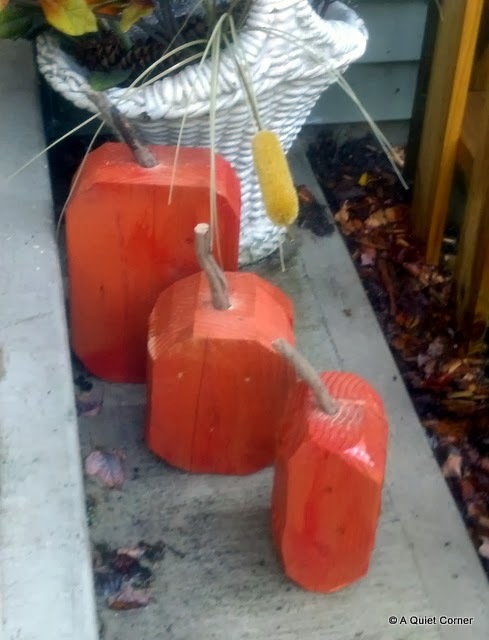 Nancy, I just want to THANK YOU for giving us the idea to make these ADORABLE RUSTIC WOODEN PUMPKINS! Didn't they come out great? Rummaging through our old pile of scrap wood, the Pres thought I was crazy...nothing new. But I had a mission and it was going to be completed! I needed to do something like this to cheer me up and it did. After we hit the grocery store, the Pres took me to Home Depot where I purchased some spray paint (Nutmeg and Cayenne). Then I found the perfect stem...a long root...not far from the wood pile and the Pres drilled to holes to size. What a great idea! No mess to toss afterwards and you can use them again and again. I will have to post my 2x4 snowmen come Christmas time. Very country. And very unique!!! I love your Arts & Crafts. your heartfelt thoughts in my blogs! Welcome Aboard! Thank you for your prayers, sweetheart! Only downer with. These pumpkins is no pies, but then you can re-use them for many years. Thanks for sharing a great and creative project, JP.